Jill, our Clinic Manager, is a graduate from the Doctorate of Physical Therapy program at Northeastern University. Her clinical experiences include outpatient orthopedics, inpatient rehabilitation and acute care. She has a certification in strength and conditioning and also completed a two year fellowship in Orthopedic Manual Therapy at the Institute of Orthopedic Manual Therapy where she refined her manual therapy skills to better serve her patients. 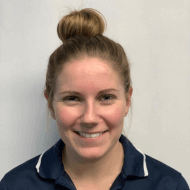 In addition to working at Bay State, Jill also works per diem at Spaulding Rehabilitation Hospital in Charlestown and has experience working with patients with neurological conditions. She takes a hands-on approach to patient care, utilizing manual therapy and exercise to maximize her patients functional abilities. In her spare time, Jill enjoys running and spending time with friends and family.